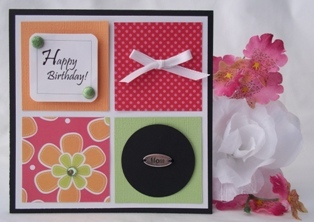 Making birthday cards for a mother, father, other family members or friends should not be a chore so here are some of my birthday card ideas to help you get started on creating your own birthday cards. Your birthday cards can be simple if you're pressed for time or it can be more elaborate if you're considering using different kinds of card making techniques and embellishments. 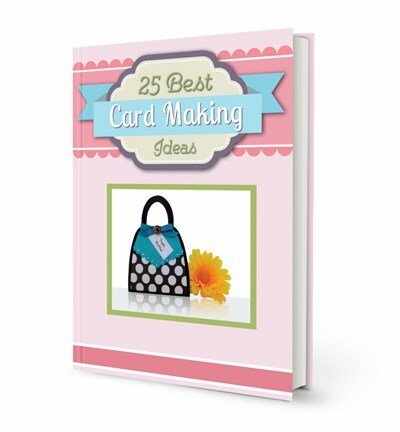 Create cards ahead of time so you aren't so stressed out when that unexpected birthday come up or just take your time and enjoy the journey of crafting a handmade card. 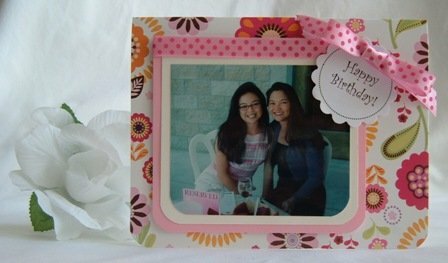 If you want to incorporate your favorite picture of you and a friend, adhere the picture onto the front of the card and round out the corners with a punch. 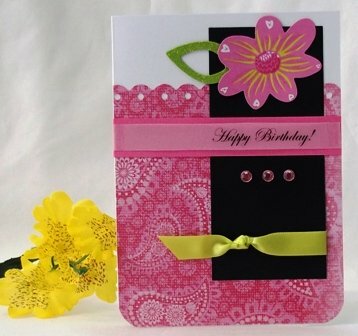 When you design a birthday card, consider who you are making it for. Does the recipient of the card have hobbies, a favorite color or pets? Does he/she like shoes, purses, food or sports? Is she/he artsy, loves nature, or is a city/country folk? Does he/she have contemporary, classic or natural style. 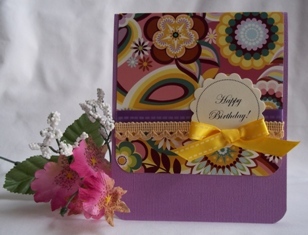 Knowing the interests of who the card is for can help when you start on the creative process. 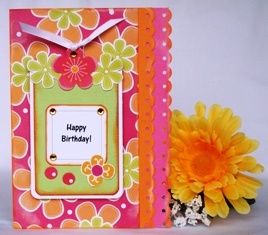 Incorporate these details when you make your own birthday cards. For this card below, on the right, I decided to use bright colors and used a black border around the squares so that the colors "popped". When making birthday cards for men, consider the color scheme. 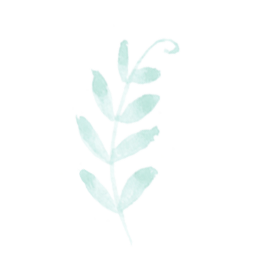 The color scheme I often turn to are blues, greens and brown. Cards for guys are more simplistic and I always feel "less is more". Horizontal cards are good for stickers or objects that are wide. The card can be left dominant or right. This card is more weighted to the right. You can also make it center focused. Use a divider line to break up the space like I did with this card. I used a black line to break up the solid paper on the left from the pattern paper on the right. I've made several vertical cards (instructions included) that you can copy so making your own cards can be a breeze. Vertical cards can be top or bottom heavy and can also be center focused. 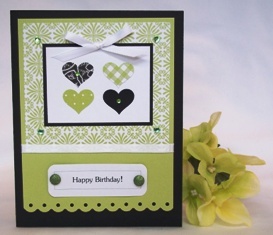 This card is an example of a card using heart punches but there are so many ways you can design a vertical card. "Girls are made of sugar and spice and everything nice". That's what an old popular song says. But we also love ribbon, lace, pink and all things pretty. 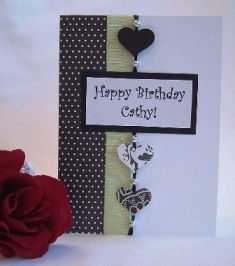 I like to use gems and glitter along with satin ribbon and beads for my card ideas. 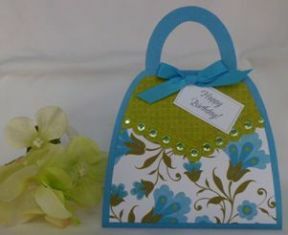 Create your handmade birthday cards using paper punches, embellishments, stickers and of course, pretty pattern paper. 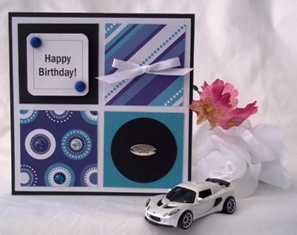 Design your own birthday card using craft punches. 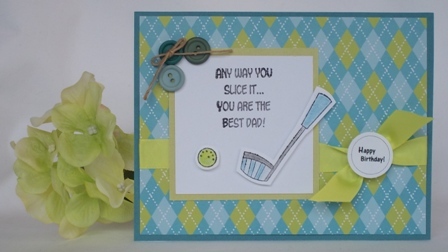 Craft punches are great if you don't want to invest in a die-cut machine but want to make your handmade cards look more finished. I like punches that are versatile and aren't specific for a season. I like border punches and different geometric shapes to start off with. 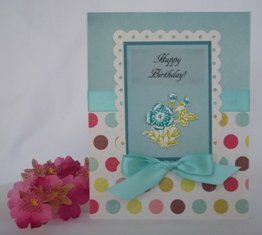 For both of these cards I used the same border punch for the scallop pieces. 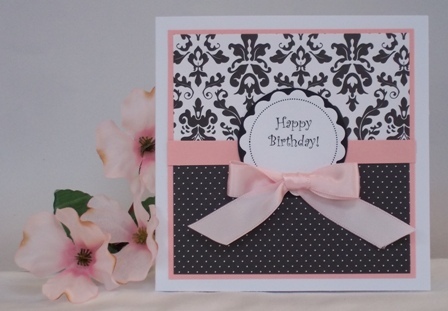 I used a border punch along the top and bottom strip of paper for the pink card above. 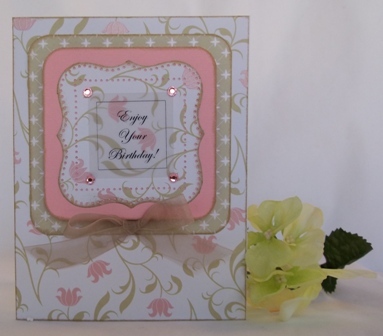 For the card below, I used a border punch for the cream scallop around the sentiment. I embellished the card with a floral sticker and typed the sentiment on vellum paper. 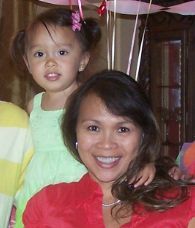 Use a photo of the birthday girl/guy and personalize it. 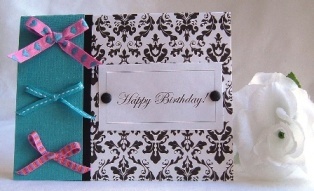 For this greeting card idea, I rounded the bottom corners of a picture and adhered it to colored paper. I used my scallop circle punch to cut out the sentiment.